Here is a household tip that Chantilly area homeowners would be wise to remember. 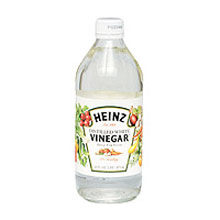 White vinegar is a terrific household cleaning solution! You are getting lots of strong chemicals with most of the commercial products on the market. If you’re like many consumers now days, you have concerns about these chemicals. You can simplify your life by using white distilled vinegar. It’s inexpensive, safe to store, and highly effective as a household cleanser. White vinegar is a potent cleaner. Its strength comes from the acidity, roughly 8%. And acidity kills most mold, germs, and bacteria. It can also remove mineral deposits from coffee makers, glass surfaces, and other types of stains. Cleaning the garbage disposal : 1/2 cup hot white distilled vinegar + 1/2 cup baking soda. Pour down drain and let sit for 5 minutes. Run hot water to flush it. Removing lunch box odors : Soak bread slice in white distilled vinegar. Place it in lunch box overnight. Remove dark spots on aluminum pots : Mix 1 cup white distilled vinegar + 1 cup hot water. Boil in pot. Brighten carpets : Mix solution of 1 cup white distilled vinegar + 1 gallon water. Test on inconspicuous area first. Remove water rings from wood : Mix solution of 1/4 cup white distilled vinegar + 1/4 cup vegetable oil. Rub with the grain. Remember though that white vinegar is powerful stuff. Be sure to exercise care when using it.